Sedona is a cute little cardi that can be worn in all seasons. It sports a ribbed collar and front band detailing. 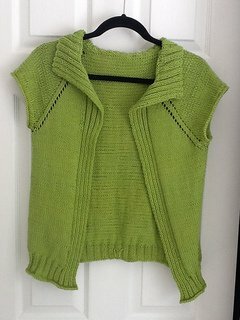 It is a breeze to knit - top down and seamless! It would be wonderful in a wool-cotton blend for spring and summer or in a warm alpaca or wool for fall and winter. for three 2-hour sessions. Materials are extra and must be purchased at Stitching memories (20% discount offered on class materials).